The Gonzaga bench celebrates during a game earlier this season. If you didn’t watch the final halves of last week’s Gonzaga games I wouldn’t blame you. The Zags smallest lead in the second half against the San Francisco Dons on Thursday was 13. They led Saint Mary’s by 33 at halftime on Saturday. It is a result of the blueblood industrial complex that Mark Few and the staff have instilled over the last couple decades that results in a well-oiled machine that is optimized by the time conference play rolls around, coupled with the apex of loaded talent through transfers meeting with blue chip prospects. Interestingly, this is the first year in a handful that Saint Mary’s is not floating in the top 30 of any advanced analytic rankings. The loss of Jock Landale and a group of seniors leaves the Gaels working with a young backcourt and a lack of a steady frontcourt hand that they typically rely on. That disposition only exacerbates the problem of dealing with Few’s efficiency behemoth of an offensive system. You won’t need to look hard to see just how unstoppable this Bulldogs offense is playing. They rank first in the nation in points per game (91.4). They rank first in field goal percentage in the nation (52.8). They rank first in assist to turnover ratio (1.81 assists for every turnover). They rank fourth in blocked shots per game (5.7). They rank fifth in assists per game (18.8). But the advanced stats show the gulf between Gonzaga and their opponents. Gonzaga is nearing a half-point per possession advantage over their conference opponent. Saint Mary’s is second to them in that statistic within the conference at a .04 point per possession advantage. Through 10 conference games, Gonzaga has a scoring margin advantage of 311 points, the highest total of all time (followed by their 280 point advantage 10 games in 2016-17). Over their last four games they have played the second, third, fourth and fifth teams in the West Coast Conference standings. Their average margin of victory is 31 points. But what may be most exciting throughout this conference run may be how the Zags have retooled on defense. 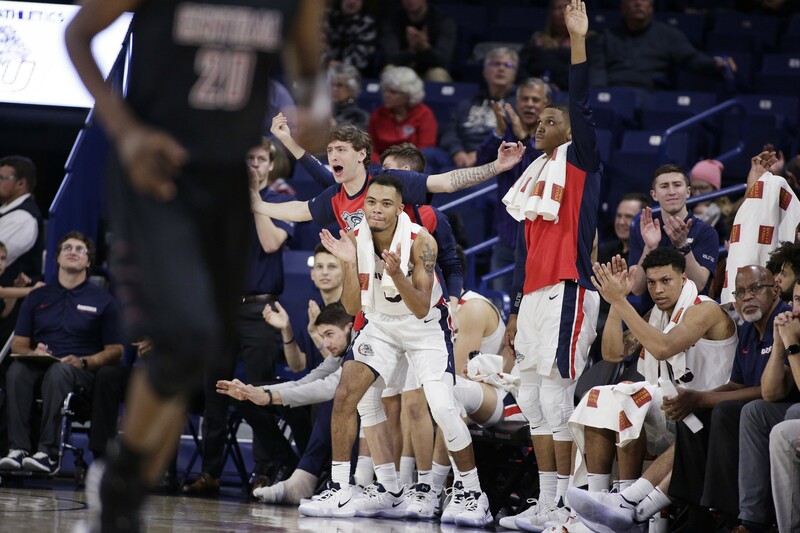 The block party held by Brandon Clarke and the rest of the front court has been fun, but the Zags defense was a liability throughout the nonconference section of their season. Coming into February, they ranked in the 40s in KenPom defensive efficiency. After they locked down the Gaels — who rank 12 in KenPom offensive efficiency — on Saturday, they now rank 20. All of this dominance helps alleviate the blow of Killian Tillie being sidelined for the rest of the regular season by the tear of his plantar fascia, which could become a major issue if the Zags lose another frontcourt man down the line. Filip Petrusev benefits by regaining some of the minutes he lost due to Tillie’s return, and his comfortability will be necessary if and when Few tries to reinstall Tillie back into the rotation in the height of March. Tillie’s perimeter shooting and defensive stretching will be missed, but hopefully won’t be required until his return against closer competition.